Shake vodka, cranberry juice and grenadine in a shaker with ice. Strain into glass. 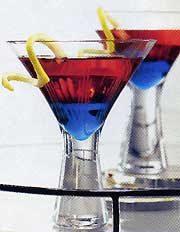 Pour Blue Curaçao gently down the side of the glass so it comes to settle on the bottom. Enjoy! Note: Alternately, you can use pomegranate juice.